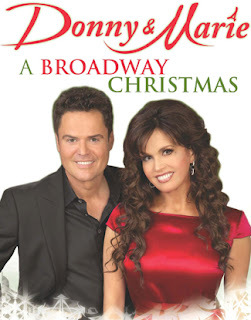 Donny & Marie - A Broadway Christmas, a new holiday production starring America’s favorite sibling entertainers. Bringing the traditions of the “Osmond Family Christmas” television specials to a Broadway stage for the first time, Sponsored by Nutrisystem it runs through December 30, 2010. We had a wonderful time in NYC on Saturday as a family! We headed into the city for a day of fun that was topped off with a visit to see Donny & Marie: A Broadway Christmas! We spent the morning looking at the lights around the city, and we took the kiddo's to see Santa at the 34th Street Macy's (a visit to Santa Land at Macy's is a family tradition for us....we love to collect the buttons that Santa Hands out in our scrapbook). Later on in the evening we headed over to our ultimate destination; Donny & Marie: A Broadway Christmas show at the Marquis Theater on Broadway. The size of the theater is absolutely perfect, and allows you to see the on stage action perfectly no matter where your seated! The show was reminiscent of their variety show, and was speckled with some lively tunes and Holiday Favorites. The princess enjoyed the music, and she had to resist standing up and dancing in her seat (mommy too!). It was the perfect way to kick off the Holidays with the family! For the perfect family Holiday experience, visit Donny & Marie: A Broadway Christmas Sponsored by Nutrisystem!